Saint Francis of Assisi received a blessing when an angel appeared next to him holding a violin and a bow. 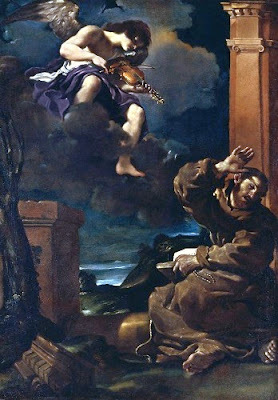 The Angel said it would play for Saint Francis as the angels play before the throne of God. Then, the angel drew the bow across the violin string, making only a single note. The beloved Saint was filled with such joy by that one sound that had there been any more, his soul would have left his body. Many stories surround the life of Saint Francis and his love for animals. Stories about his preaching to the birds or befriending a rabbit, and taming a wolf. The recently elected pope from Argentina is the first to chose the papal name Francis, the name of the rich young man from Assisi who renounced wealth and founded the Franciscan order of friars in 1290. Saint Francis is known as the patron saint of animals, and praised all creatures as brothers and sisters under God. Just as Saint Francis was blessed with one musical note from an angel, we , too, can receive blessings from God. May your day be filled with music that fills your soul.